Short people need mounting blocks to get onto tall horses. Young people who don't love to read need easy, interesting books to help them get onto the fast horse called Reading. Over the years, many of my books have been that mounting block. 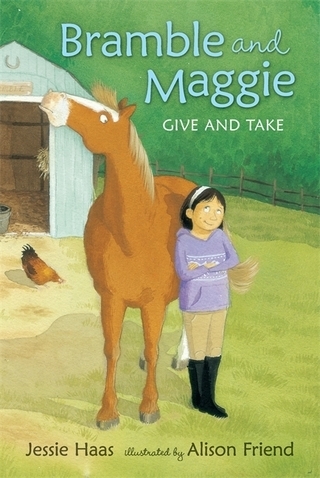 Horse stories often appeal to girls who are having difficulty with reading. Many boys like them too. “I never thought I could learn to love reading,” one fourth grade boy told the school librarian, “and then I found my Radish.” He was hugging the library copy of Runaway Radish. Read in the right order, my books can help a child overcome that left-out feeling, and discover that reading is fun. From there it's only a short step to anything that child wants to learn or experience. Reading is freedom, community, adventure, and a great consolation in times of solitude. There's nothing that feels better than helping a kid over the hump, into that happy land. 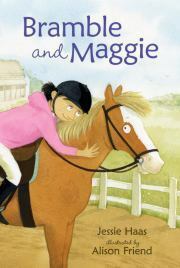 Bramble, an opinionated lesson horse, gets a girl of her own, horse-loving Maggie. Bramble adjusts to life in the suburbs. She and Maggie learn that neither one should be the boss all the time. There should be some give and take. Autumn makes Bramble spooky, and soon Maggie is scared too. Why do they call it 'Fall'? Halloween brings its own perils, and its sweet triumph. 52 page early reader chapter books, with full-color illustrations on every page. A free curriculum guide covering all three books. Download on my home page. Order at your local bookstore or online, or find at your public library. Radish is a feisty pony who raises Judy, and teaches her to be brave. When Judy outgrows him, he moves on to Nina. But girls always outgrow ponies, and Radish needs a forever home. Popcorn and Jane were born on the same day, many miles apart. Obviously they were meant for each other, but Jane is small and far away, and Popcorn needs a rider. So Grandma Aggie sells him. By the time Popcorn and Jane are finally united, Popcorn has learned some bad habits. Jigsaw is a black and white pony who lives in a weedy pasture. Every day the mailman gives him an apple—and one day his owner gives Jigsaw to the mailman, for his twin daughters. Fran and Kiera don't agree about anything, but they do agree that Jig is perfect. But why won't he jump? Why won't he canter? It turns out that Jigsaw is too old to do many things the girls want, but he is still the perfect pony. chapter books, with black and white illustrations. Newly independent readers age 7 and up. Jigsaw Pony—order at your independent bookstore, online, or www.jessiehaas.com. "When Radish was a round, red, bouncy young pony, his little girl's name was Judy. Before he got Judy, Radish lived on a big pony farm. He ran and played with the other ponies. He learned to go fast. He learned to think for himself. A trainer taught Radish to let himself be ridden. She was a good rider. Radish had to do whatever she wanted. Then Judy's parents came to the farm. "We want a pony for our little girl," Judy's father said. "Radish is my best pony," said the trainer. "He's smart and he's brave. But he does have a mind of his own." "So does Judy," said Judy's mother, and they brought Radish home to be Judy's pony. Feisty Radish teaches Judy to be brave, and Nina to be careful. But girls always outgrow ponies. Can Radish find a forever home where his talents will be appreciated"
Popcorn and Jane were meant for each other, but fate has other plans for each of them. When they finally get together, Popcorn has become a spoiled and difficult pony, and Jane needs some lessons in bravery from the best teacher of all, Radish. Twins Fran and Keira can't agree on anything. Is Jigsaw a black pony with white patches, or a white pony with black blotches? Should they ride him English or Western? Jumping or barrel racing? Jigsaw is game to try anything, but he has a secret, and when they learn it, the twins finally find the one thing they agree on. Beware the Mare When Gramp brings a little mare home for Lily, she seems perfect. But why is she named Beware? Gramp checks her out thoroughly, but it's Lily who finally finds the answer to the mystery. A Blue for Beware Lily and Beware compete in a local horse show. Lily discovers how difficult it is to compete against your best friend, when you both want blue ribbons. Be Well, Beware Beware is very sick, and Lily works with the vet to save her life. Beware and Stogie After a big storm wrecks the fence, Gramp's animals get out. Everyone comes back except the wild black horse, Stogie, so Lily sets out on Beware to find him. Simple horse stories with large print, and black and white illustrations. When horsedealer Gramp brings the little bay mare home, she seems perfect for Lily. But why is she called Beware? Gramp is determined to find out before he turns the horse over to Lily, but in the end it's Lily who solves the mystery. Beware doesn't come in from the pasture one day, and Lily discovers that she is very sick. A long day and night of nursing her and working with the vet leads, finally, to a happy ending. Lily takes Beware to the local horse show. But it's complicated showing against your best friend, when things don't go well, and even more so when they do.